"A World War II veteran recounts firsthand horrors on bloody battlefields and passionate liaisons in Middle Eastern nightclubs as a Grecian soldier. Hadjifotiou's (Games of Passion in Mykonos, 2015) life was interrupted by war, with Mussolini's invasion of Greece spurring him to leave home and join the fight against the Axis powers. He enlisted in the British army and found himself in the port city of Tobruk, Libya. Here, he was one of history's famous "Desert Rats"--men who spent eight months of hell under siege by Field Marshal Erwin Rommel's troops: "Thirty-five thousand wounded and several thousand dead." Hadjifotiou's reputation as one of Tobruk's heroes afforded him numerous promotions and military decorations. He was eventually assigned to pilot a crane named "Mac" to salvage Allied vehicles and save trapped soldiers. Between the siege and battles against German forces in both El Alamein, Egypt, and Rimini, Italy, he spent many of his nights with fellow soldiers acting out in the urbane nightclubs of Egypt, and later Beirut, seeking pleasure and luxury with alcohol and women. The author recalls his wartime adventures with a dry romanticism, never shying away from his experiences, be they vodka-fueled nights or hand-to-hand combat on the battlefield. Hadjifotiou is short-tempered and apolitical, prone to nostalgia in unexpected ways--the soldier recalls his crane with more sentimentality than his whirlwind marriage to a French general's daughter. When reunited with his lost love, Yuki Russell, a Jewish-American singer he met early in the war, his enthusiasm will likely seem shocking to some, as he seemed to have all but forgotten her before. There's no sugarcoating these oddities, no rationalizations made for these arrogant or reckless turns any more than for the heroic ones. The closest the book comes to indemnifying the actions of any--from womanizing to looting--is to maintain that those who were not there cannot know. The autobiography is remarkably concise, perhaps to its detriment--it's unlikely readers will feel transported to nightclubs or war zones with its minimalist approach. 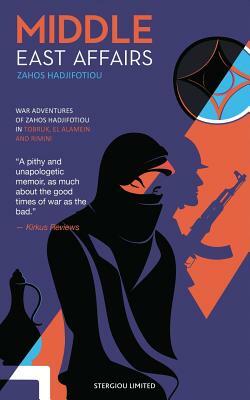 A pithy and unapologetic memoir, as much about the good times of war as the bad."